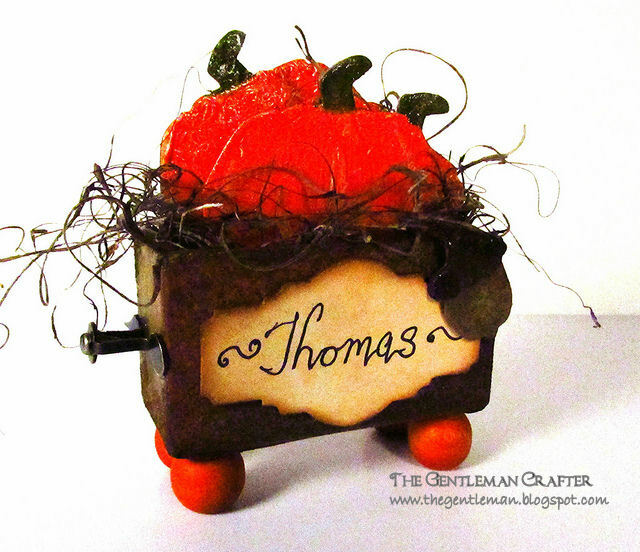 The Gentleman Crafter: Inspiration Emporium November Challenge! I'm out on my front porch at 9:30 p.m. enjoying the breeze coming through kissing my bald head and making all five hundred of my wind chimes clang, chime and ring. So enjoyable! I love Fall! It's so nice to just sit back and chill for a while! Ahhhhhhh! Tonight I wanted to share with you all the Inspiration Emporium Design Team Challenge for November. 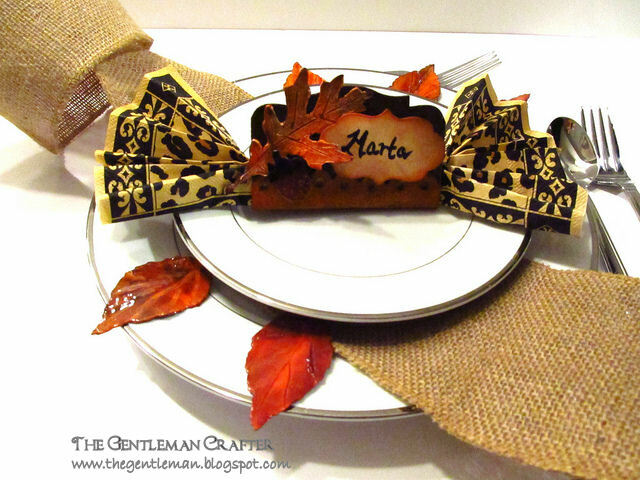 To create something to embellish the Thanksgiving/Fall Table. So place card holders is what I came up with. Two versions...One more fun and the other a bit more elegant I think. Supplies for this project can be found at Inspiration Emporium. Inkssentials Surfaces - Manila Cardstock - 12 x 12"
Ink the sides of the 2 x 3 Configuration Box with the Ripe Persimmon and Gathered Twigs Distress Ink. Next, apply perfect Medium to the edges and cover with Vintage Photo Distress Embossing Powder. Heat emboss the Distress powder. With flat nose pliers, bend the Game Spinner pieces to form handles and apply to each end of Configuration Box with Glossy Accents. 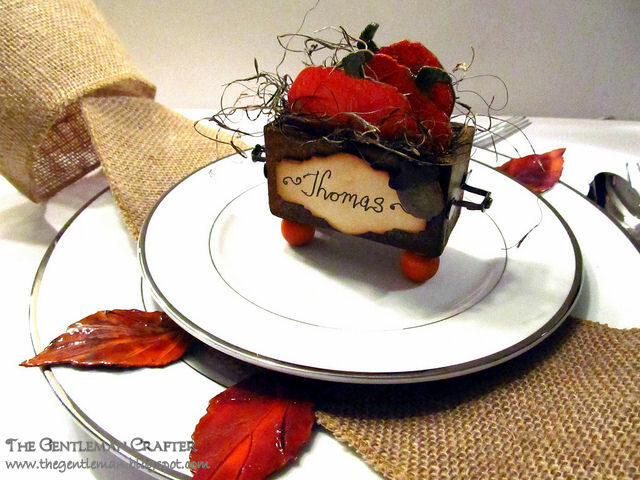 Ink the 1/2-inch wooden ball feet with Ripe Persimmons Distress Ink and adhere to all four corners with Glossy Accents. Cover a 3 x 3 piece of chipboard with a small piece of the Manilla Cardstock. Next, Die cut the Sizzix Movers and Shapers Styled Label from the chipboard/cardstock piece. Distress the edges with Gathered Twigs Distress Ink and adhere to front of trug. Diecut the Movers and Shapers Mini Acorn and Pumpkin from chipboard. 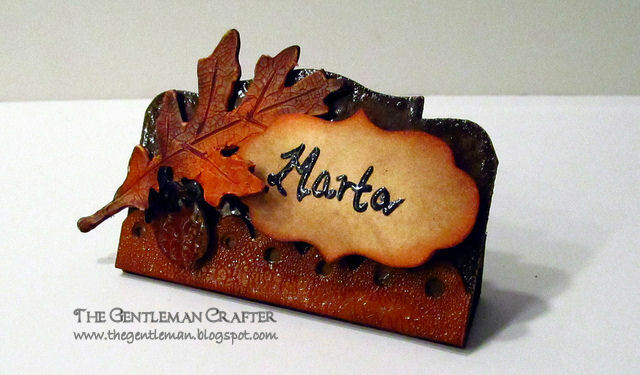 For the pumpkin shape, ink with Ripe persimmons Distress Ink. Apply a coat of Clear Rock Candy Crackle Paint and allow to crack. For the acorn, apply a layer of the modeling paste to the front. Allow to dry. Dab a small amount of the Black Soot and Vintage Photo reinkers to the surface and spritz with water to meld the colors. Allow to dry. Last glue the acorn to the front of the label, add some Spanish Moss to the trug and place the pumpkins inside...Done! Trug? It's too cute no matter what you call it. Love the other place card, too. Looking forward to seeing the video. Trug...LOL! We used to sell them at Higginbottom's at The Arboretum years ago. I assumed it was a basket for gathering your garden goodies...Flowers and veggies. I think mine looks like a crate on legs! LOL! Those are both great ideas Jim; particularly like the trug. It's very stylish methinks! Thanks Tons Neil! I wish you could see the crackle on the pumpkins better. They really came out cool. Thanks man! J.
I Like !! Glad you got a chance to "chill" and enjoy the weather. It has been cold and windy here (Altadena, California) today ( very crisp) but oh so pretty; blue sky, white clouds, some heavy clouds over the mountains... I exspect to see snow in the mountains tommorrow if it rains tonight!! Rea, It's so funny as I sit out on the porch drinking coffee this morning it's humid, but still very breezy. Supposedly cool front coming in at 2:00 p.m. CST. Which will bring some rain! Yahooo! Snow! I can count on both my hands how many times I've seen snow in Texas! LOL! I bet your Bassets love the squirrels! Mine are off and on-ish Depends on their mood...Do I get up and chase the squirrel or do I sit here and relax some more? LOL Got to love the breed! Have an awesome day Marc! BTW, I think my Crafty Embelies order is here. Got a delivery notice that needed to be signed in the mail on Thursday. Signed it and was hoping to have it Saturday but no delivery. Guess it will come Monday. So excited! Both are lovely but especially like Trug! Thanks Tons Ursula! You Rock! These are great! The trug is clever. Love it's little feet and the handles from spinners. Thanks for sharing. Sharon! Thank you so much my friend! The feet are actually the second set. I had them inked with Gathered twigs but removed them because I felt like it needed a pop of the Ripe Persimmons toward the bottom. Enjoy the autumn crispness. I like both displays, was intrigued at the use of the spinners I miss TH hitch posts. The additional leaves on the plate are striking. Beautiful Jim -- I'm learning so much from you -- one of the best things is patience with myself, thank you. Love your videos! Ahhhh, Good old patience....I pray for more every day! Thank you Mary! You Rock! Thanks Cheesh5! I'm on it! Good idea! Very cute. Will be watching for the video tomorrow. We are an aging family (no kids left at our table) so doing little things, keeps it festive. thanks as always for sharing. Jim, these are gorgeous and so festive for the table setting. Luv this, I can see how easy these could be converted to Christmas ones as well. Always thinking ahead!!!! Thanks Jim, looking forward to tutorial as well.